Cooking Korean dishes in Poland is a challenge. When I decided to make a culinary entry as my first post, I was full of optimism. My leitmotiv for the post turned out to be a Korean Buddhist temple cuisine, but while browsing the recipes and making notes (which took me over 3 hours), I realized I can prepare no more than two small dishes. I visited the nearest Asian grocery store and it confirmed me in the belief there’s no sense for me to even think about temple cuisine. There were no lotus leaves, no jujube fruits, no required herbs. And this is not the end of complaining! No cellophane noodles, no soybean paste, no nothing. That’s why for someone living in Poland Korean cuisine is an adventure. But let’s stay optimistic and try to make all those fantastic Korean dishes with ingredients that we can get. 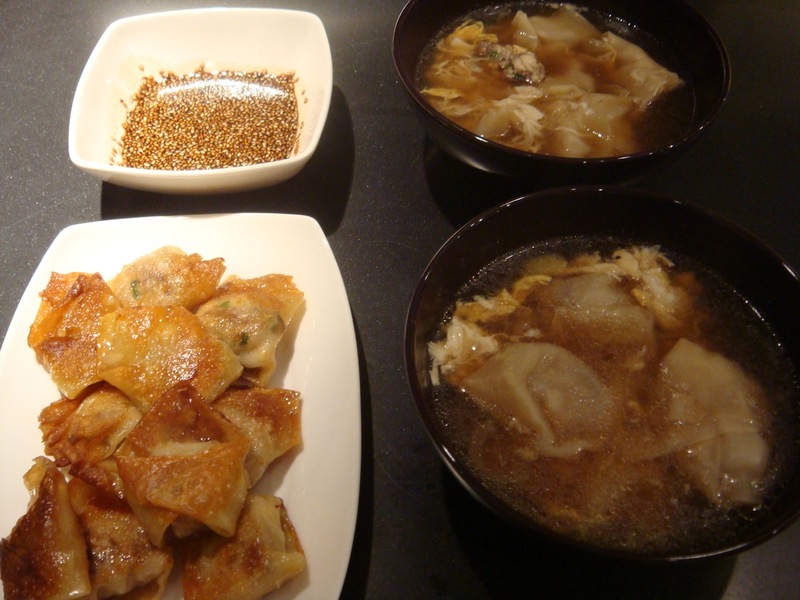 Mandu 만두 means dumpling in Korean, guk 국 in this case refers to a watery, soup-like dish. We could say then that Manduguk 만두국 is nothing else than a dumpling soup. According to history, mandu were brought to Korea in 14th century during the Goryeo Dynasty, but historians don’t exclude the possibility that they came to Korea at a much earlier period. 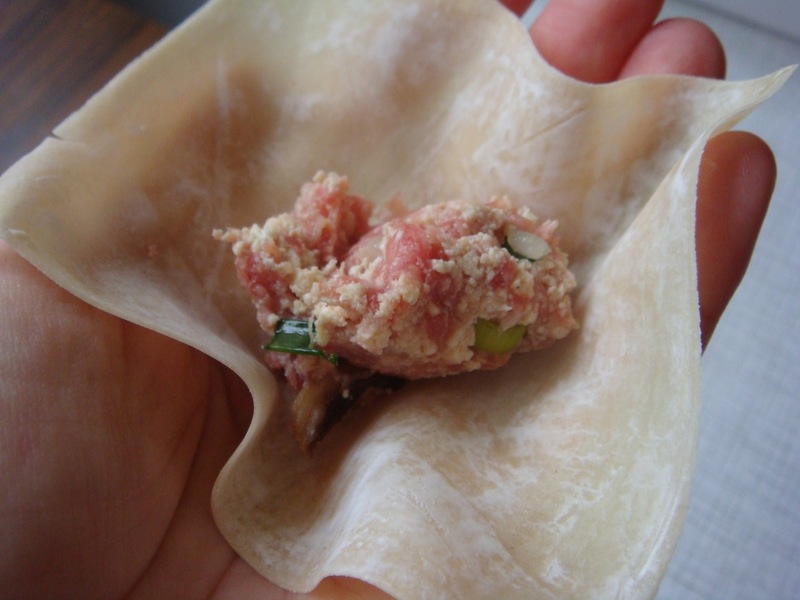 A package of mandu skins I got is actually a package of wonton skins, but the ingredients are the same. It’s the only type they got in the nearby Asian grocery store. It counts 35 skins and they can be used both for boiled and for fried dumplings. You can easily make it by yourself by mixing flour with water and rolling it into a dough. The dough should be thinly shaved into circles. 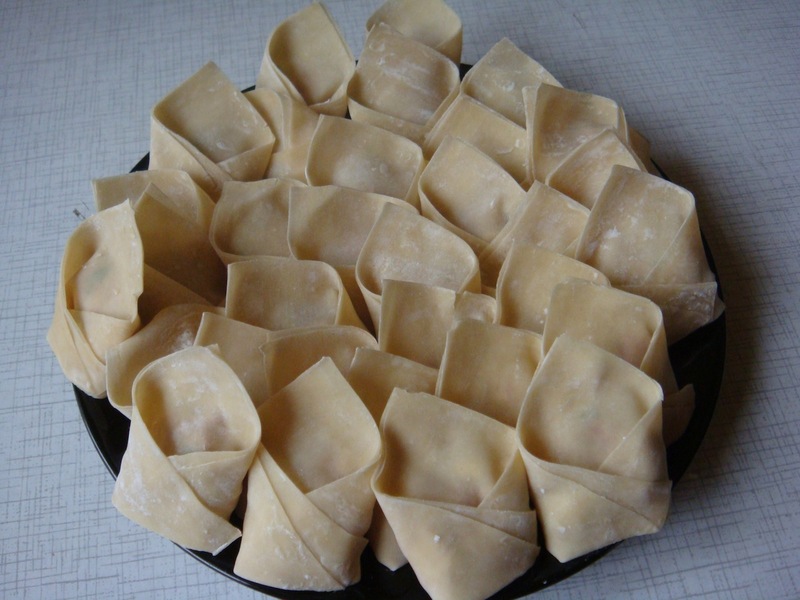 Unfortunately, the wonton skins are square shaped, but let’s make the dumplings this way. 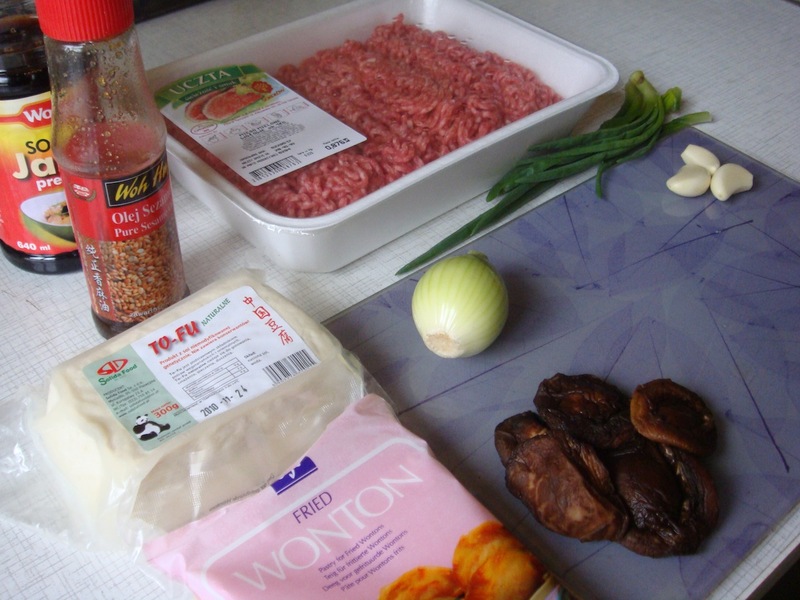 First you need to put the ground beef into a bowl and mix it with 1 teaspoon of salt, 1 tablespoon of sesame oil and 1/2 teaspoon of ground pepper. Chop the chives, add 1 tablespoon of oil, mix it well and put it into a big bowl right next to the ground beef. Chop 5 soaked shiitake mushrooms and half an onion and put them into a different bowl. Add 1 teaspoon of soy sauce, 1 teaspoon of sugar and 2 teaspoons of sesame oil, mix it well with your hand and put into the main bowl. Squeeze the tofu, preferably through a cotton cloth, and place it into a small bowl. Add a pinch of salt and 1 teaspoon of sesame oil, mix it well and put it into the main bowl. Add 3 cloves of minced garlic and mix all ingredients by hand. 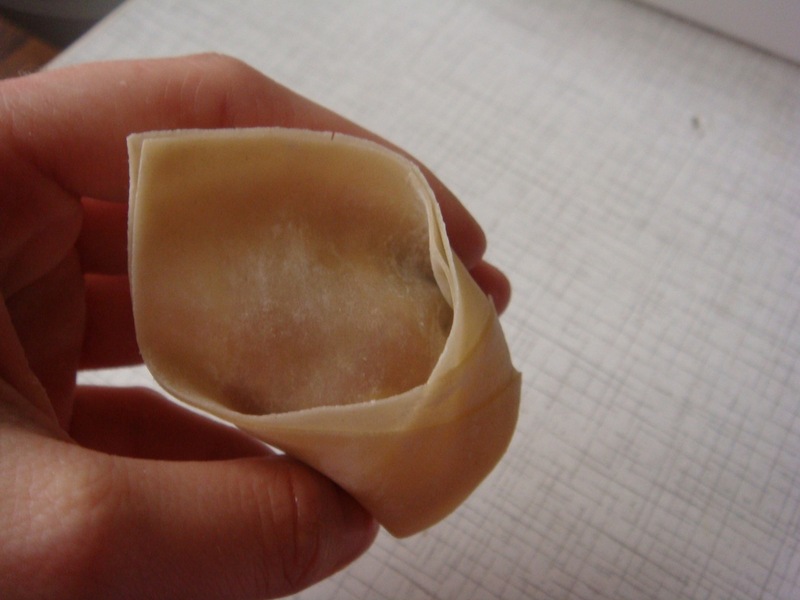 Now put some filling on the center of the mandu skin, put a little cold water on the half of the edge of the skin, fold skin in half and press edges together. 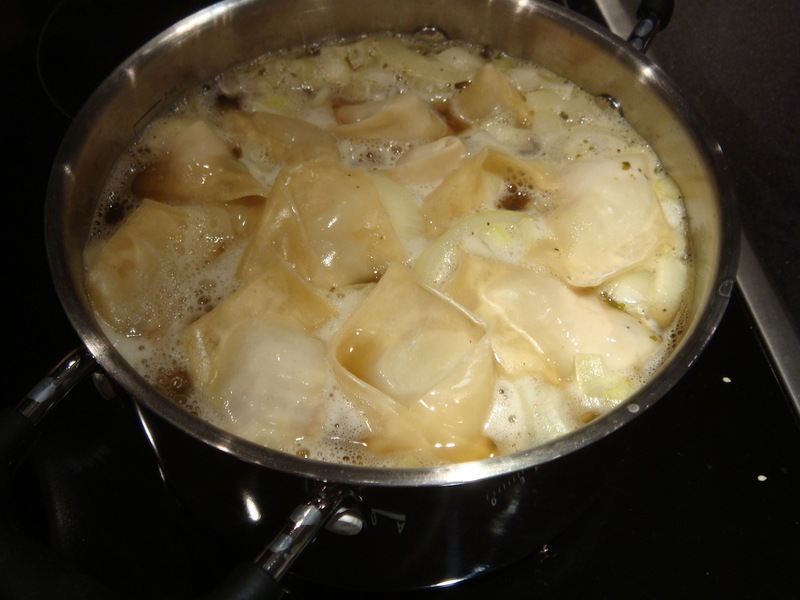 Put soup stock into a pot, bring it to boil, add sliced onions and dumplings. 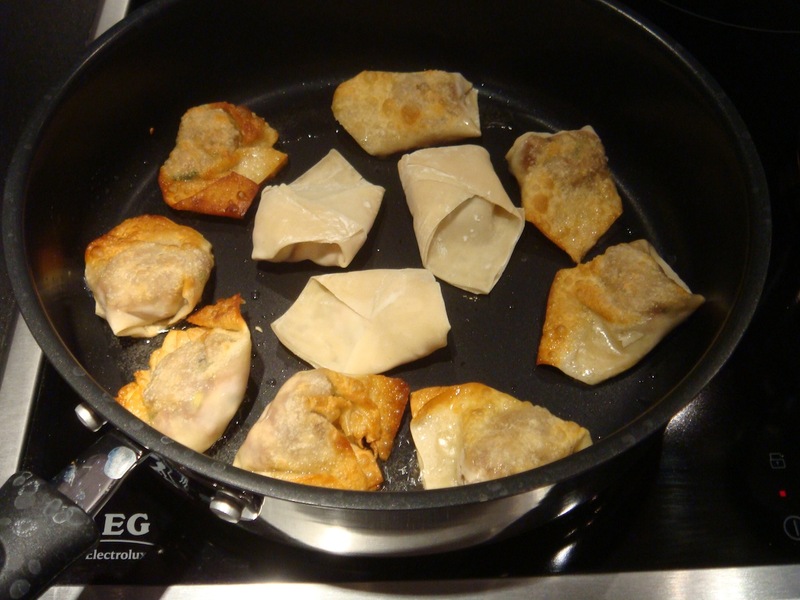 Let it boil until the dumplings start floating – it should take not longer than 3 minutes. Add soy sauce, black pepper and some salt if needed. At the end add a beaten egg. Your Manduguk is ready. 1/2 teaspoon of grilled sesame seeds. I understand you that it is so hard for you to find some of the ingredients. And one more thing, I’m surprised by your Mandu’s shape. Because your Mandu is new style and unique comparing to those I’ve ever seen. The important thing is fillings for dumplings.